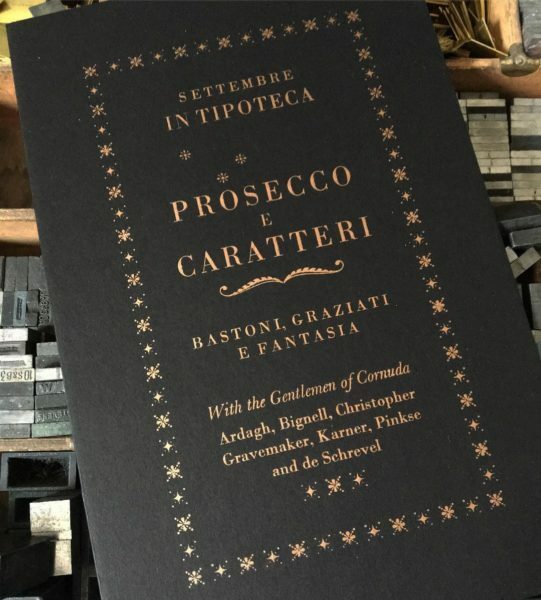 In Settembre I will be joining a pleasant company of fellow typographers to sample the delights of the Tipoteca collection at Cornuda, Italy. Nestling in the Prosecco hills Tipoteca is a working Letterpress museum, archive and workshop conserving rare Italian type and machinery. Featuring Thomas Gravemaker (LetterpressAmsterdam); Richard Ardagh & Graham Bignell (New North Press); Sander Pinkse; Michael Karner Typographie; Stéphane de Schrevel (Function Matters). Follow our endeavours on IG, FB etc.